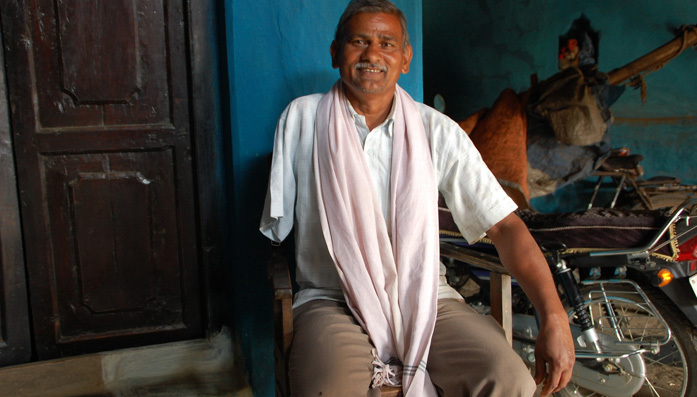 Twenty years ago, Yashraj lost his left arm in an electrical accident. While he had made a good physical recovery, he struggled emotionally to come to terms with what had happened and became isolated. His life changed when CBM’s partner organisation approached him about setting up a self-help group for disabled people. "I was known in the village as being good at electrics. So, it came as little surprise when a neighbour asked me to help with a fallen electrical pylon on his land. The first thing I did was to ensure that the main supply switch was turned off. I climbed the adjacent pylon, but as I was up there, another person who was unaware of what was going on switched the supply back on. After I recovered from the physical injuries, I was hit by severe depression. People were nothing but supportive, but I feared social ridicule. Reluctance turned into defiance and I stopped going to social gatherings, I even stopped going to the village to get essentials. I stayed indoors for two years! If it wasn’t for my family, I think I may have committed suicide. I was asked by Naman (CBM partner Naman Sewa Samiti) to form a Disabled People’s Organisation DPO, a small group of people with disabilities who together offer mutual support and are activists for the rights of people living with disabilities. Facilitating the group, hearing the stories of the members, and observing how they faced life with dignity challenged me to look at my own life. Yashraj is now widely known for his work with a number of disabled people’s organisations, which help people with disabilities to support themselves and have a voice in their communities.